King Arthur and his Knights of the Round Table were Scottish, Camelot is a marsh in Argyll, and Iona, rather than the fabled isle of Avalon, is the final resting place of the mythical king. King Arthur has been claimed by England, Wales and even Ireland, but a Scottish amateur historian and author has now claimed that his roots were actually Scottish. 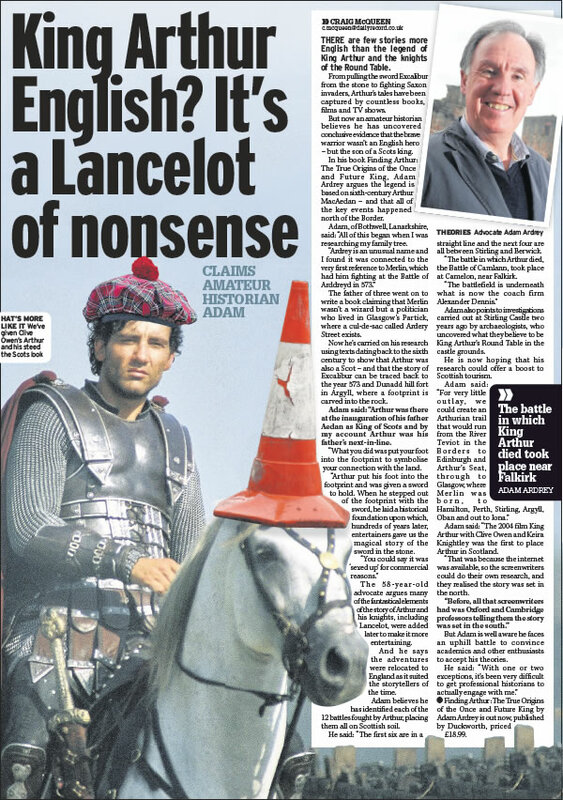 The claim is made by Adam Ardrey, an Edinburgh advocate. In his book Finding Arthur: The True Origins Of The Once And Future King, Mr Ardrey states that the Arthurian legend is based on the life of a Scottish warlord, Arthur MacAedan, who was born in AD559 and worked with Merlin, a politician from Partick in Glasgow. Mr Ardrey argues that the myth of Arthur pulling Excalibur from a rock is based on a ritual performed by Scottish kings and their successors at Dunadd, near Kilmartin, Argyll. He said: “MacAedan was the son of Aedan, a king of Scots, who ruled at the end of the sixth century. During the inauguration ceremony, kings and their would-be successors had to place their feet in a footprint etched in the stone at the top of Dunadd. Mr Ardrey insists that “the litmus test” for his Arthur theory is the 12 battles he fought. “I was able to identify all of them geographically with places in Scotland and put them in historical context. The first six are in a straight line, and the next four are all between Stirling and Berwick He said that the Battle of Camlann, at which Arthur died or was fatally wounded, was fought at Camelon, near Falkirk, 12 miles south of Stirling. Traditionally, the legend of Arthur belongs to the southwest of England or Wales, but Mr Ardrey believes that the stories were taken there by refugees from northeast Scotland who were driven south after the Angles defeated them in the 7th century. It is not the first time that someone has placed Arthur in Scotland. The Scottish folklorist Stuart McHardy’s book The Quest for Arthur, published a decade ago, suggested that Avalon was the Isle of May, off Edinburgh. An English historian, Simon Andrew Stirling, also put forward Arthur’s Scots credentials in his book The King Arthur Conspiracy — How a Scottish Prince Became a Mythical Hero. Aberdeen Voice received an advance copy of Adam Ardrey’s book, ‘Finding Merlin The Truth Behind The Legend’. Suzanne Kelly read the work and found not a sword-in-the-stone work of sorcery, but a well-constructed case for Merlin’s being a historical figure – from Strathclyde. Suzanne explains. Archaeologists searching for King Arthur's round table have found a "circular feature" beneath the historic King's Knot in Stirling. LEGENDS of King Arthur and Merlin could yet become recognised as a part of Argyll’s identity when a fact-finding meeting is held next month. 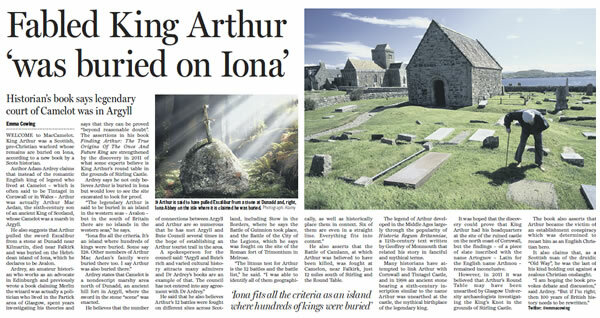 Researcher and advocate Adam Ardrey has released two books detailing his belief that the king who pulled the sword from the stone was from Argyll and that the Isle of Iona is, in fact, Avalon - his reputed burial place. Adam recently attended a meeting of the Oban, Lorn and Isles area committee and has been invited to speak further to Argyll and Bute Council’s next month, where he will make his pitch for the area to jump on a potential tourism boon. He said: ‘The timing is perfect for Arthur. 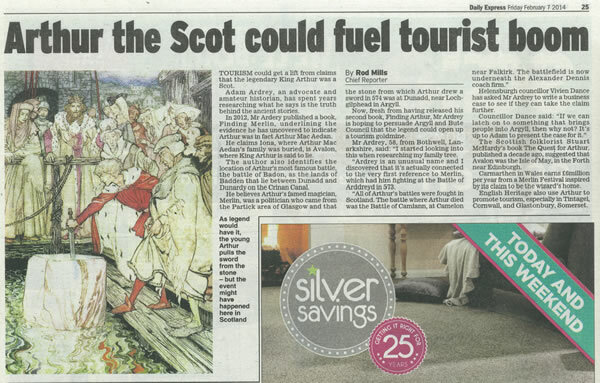 ‘There is bound to be a lull in Columba-based tourism fol­lowing this year of celebration of Columba’s arrival in Argyll. The matter of Arthur can take up where Columba left off - they were, after all, contemporaries. ‘Better still, as I said to the area committee, if you ask 100 Americans ‘who was Columba?’ you will be lucky to find one in 100 who will know. If you ask 100 Americans who King Arthur was, you will be lucky to find one in 100 who does not know. Finding Merlin is now available to buy online and in bookshops. To purchase on Amazon click the link below. Finding Arthur is now available to buy online and in bookshops.